Senior commanders try to reassure leaders of northern communities about threats; are told to cancel security budget cuts. IDF Northern Commander Yair Golan on Sunday met with a forum of leaders of communities on the northern border with Lebanon, and attempted to assuage concerns raised by the testimony of citizens that Hezbollah is preparing terrorist tunnels into Israel. Many residents of the north have reported hearing the sounds of digging and hammers from underneath their homes, coupled with evidence of active cement mixers and construction trucks carting out earth on the Lebanese side under the cover of greenhouse structures. The threat is more pressing given the wide network of lethal tunnels unearthed in Operation Protective Edge in Gaza. Golan tried to reassure community leaders that no cross-border tunnels from Lebanon are currently known of. He added that although the threat of rocket attacks remains the main security issue in the north, the IDF is preparing to deal with the threat of Hezbollah tunnels. Homefront Command Chief of Staff Brig. Gen. Dedi Simchi was also present at the meeting, and promised that the lessons of the ongoing operation in Gaza will be implemented in the future in terms of security threats from the north as well. While community heads expressed satisfaction at the information presented to them, Walla! reports that they demanded that Golan immediately cancel the security budget cuts for the northern communities near the border. "Residents of the northern cities are aware of the security threats visible from over the border," said Sivan Yehiel, chairperson of the forum and head of the Kfar Vradim local council. "The state of Israel must pay attention to the northern front and the security threats it presents; despite the eight years of quiet - we must not be complacent." Geologist and res. 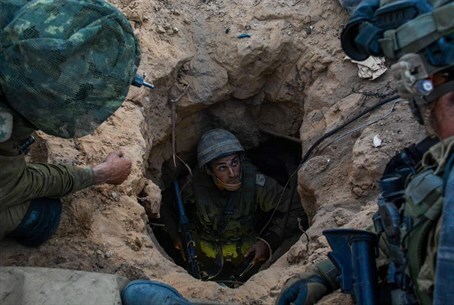 Col. Yossi Langotsky last week told Arutz Sheva that he had tried to warn the security establishment about the tunnel threat from Gaza for nine years, but that his warnings fell on deaf ears.